April 10, 2017 – The Oakcliff Development Team has begun work with Vestas 11th Hour Racing. The first team, consisting of graduates Sean O’Halloran ‘16 and Madeline Gill ’12 have spent the past two weeks elbow-deep in the hard work of preparing a Volvo Team. In recognition for the support they received from the Morning Light and the Oakcliff All American Offshore Team, Towill and his Skipper / Co-Founder teammate, Charlie Enright, have chosen to offer additional young sailors this opportunity to start out in the world of competitive sailing. As dedicated environmental stewards, they help them understand what it takes to build a team and run a campaign sustainably – Vestas and 11th Hour Racing have joined the 2017-18 Race with the mission to achieve exemplary results in sport and be the most sustainable team in the race. 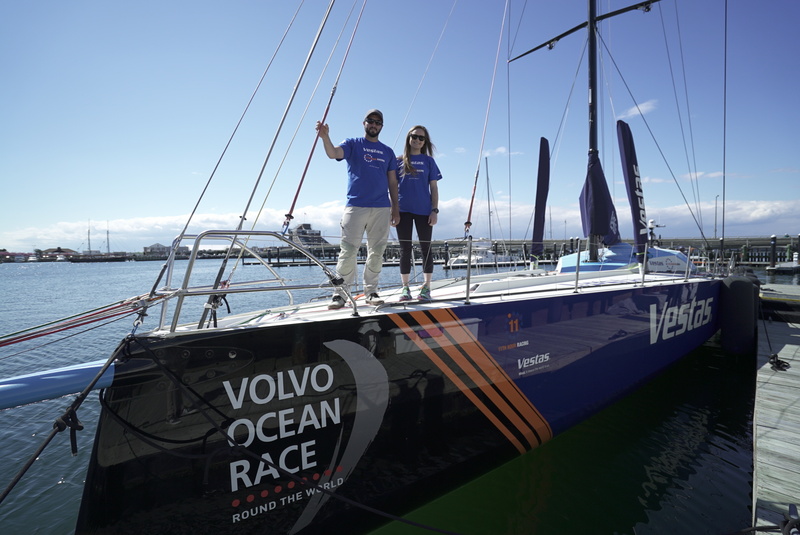 Two Oakcliff graduates will be embedded with the team at each stopover of the Volvo Ocean Race. There are currently 165 graduates and the expected 40 or so program participants from this summer will also be eligible to participate. The Oakcliff Development Team is a comprised of graduates with skills in all aspects of professional sailing from shore to the water. They also have a continuing desire to continue their progress to joining the top echelons of our sport. Team members have already been a part of events such as the Farr 40 and Melges 32 World Championships, RC 44 Series, and now the Volvo. The Development Team is the final step in the Oakcliff pathway which sees trainees go from fresh and keen to solid and experienced sailors and citizens and eventually end up valuable parts of professional teams. Madeline grew up sailing at Cedar Point YC in Westport, CT – coming from a large family of sailors and naval architects (as well as a few siblings a bit less enthusiastic about the water). She learned to race in Vanguard 15s in 1996 and has loved the competitive nature of the sport ever since. She recently graduated from the University of Virginia with a degree in Environmental Sciences. During her four years in Charlottesville, she raced with the school’s sailing team and had the opportunity to study abroad in Sydney, Australia where she enjoyed many more sailing opportunities. As a newly inducted member of the American work force, many opportunities were thrown her way; all of which she turned down to spend another summer sailing on Long Island Sound. Madeline is currently a valuable part of Goetz Composites, serving as their Production Coordinator & Special Projects Manager. Sean was introduced to sailing at a young age when he and a friend sailed (and capsized) during a week-long vacation near his home town of Santa Clara CA. He loved sailing at that time but did not get back into it until college. Sean heard there was a sailing team at Johnson & Wales University in Providence, RI so showed up at the team’s practice. At 6 feet tall and weighing over 200 lbs, being a skipper was his only option. With limited experience he spent the first couple of weeks on the dock watching future teammates, and at home watching endless YouTube videos. Eventually, he got his shot to skipper, and for the next few years sailed as much as he possibly could. After college, Sean was determined to sail on as many big boats as possible including most J-boats and the America’s Cup boat USA 76. When you’re face-to-face with the elements, in the grip of the Wind and the Water, you know that standing still means falling behind. To move forward, we’ve got to work together. Vestas and 11th Hour Racing join forces to compete in the 2017-18 Volvo Ocean Race with one simple mission: Achieve exemplary results in sport and be the most sustainable team in the race. This is our opportunity to win the most epic sprint around our fragile planet, whilst showcasing business as a force for good. As experienced organizations and individuals, we understand the need to set a precedent whereby helping you, our partners and fans, accomplish your own sustainable goals. We advocate for effective solutions for a clean atmosphere and marine habitat, harnessing the power of nature for a cleaner tomorrow, and using unparalleled knowledge to empower collaborative, systematic change for our environment. Get involved, above and below the surface. Let’s lead sustainability, together. The Volvo Ocean Race is the ultimate ocean marathon, pitting the sport’s best sailors against each other across the world’s toughest oceans. The legendary race that began in 1973 will start from Alicante, Spain in October 2017 and finish in The Hague, Netherlands in June 2018. Featuring almost three times as much Southern Ocean sailing as in the previous edition, the Volvo Ocean Race 2017-18 will be contested over the longest distance in the race’s history at around 45,000 nautical miles, crossing four oceans and taking in 12 major cities on six continents. The Volvo Ocean Race has been the global sponsorship flagship of Volvo Group and Volvo Car Group since taking ownership of the Race in 1999. The Volvo Ocean Race is operated as a non-profit organization.